Dark chocolate lovers rejoice! Seventeen decadent dark chocolate filled Belgian pralines nestled in this classic ballotin box will provide a dark-chocolate lover with everything they need for the ultimate gourmet treat. Neuhaus is world-renowned for holding the highest standards in authentic Belgian Chocolate. Since 1857, Neuhaus chocolates have been crafted entirely in Belgium with only the finest ingredients. These fine chocolates are non-GMO and are imported fresh weekly. Dark chocolate lovers rejoice! 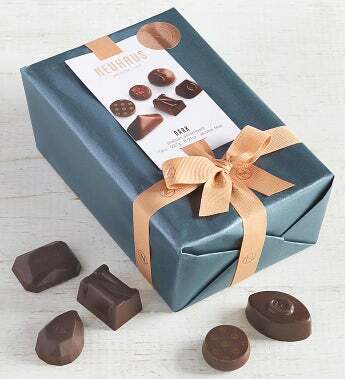 Seventeen decadent dark chocolate filled Belgian pralines nestled in this classic ballotin box will provide a dark-chocolate lover with everything they need for the ultimate gourmet treat.